1962. 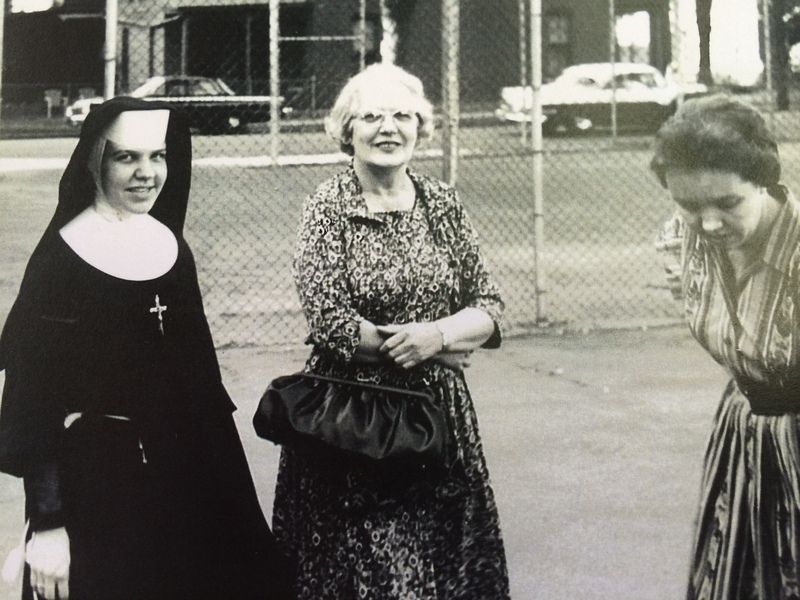 My Aunt Carolyn Thirtle (still a Franciscan nun, she was known as Sr. Edith Ann here), my grandmother Bea Thirtle and my mom, Jeanne Marie Thirtle Prescott. It’s dated April 14, 1961, and it came in the mail yesterday with other treasure from the past. It’s a letter that my great uncle Martin Chicoine wrote to his aunt, Leona, sometime after his mother, my great-grandma Cora Chicoine died. It’s four full pages of typewritten narrative by a talented man I never knew. (He died about four months after he wrote this.) He spent his career as a journalist, partly with the Voice of America. I have been to his grave at Arlington National Cemetery and made a rubbing of the headstone. But in this letter (and there will have to be another post about it!) Uncle Martin explained something to me about myself. You didn’t read about any airplane crashes, so you know we landed safely. I know Mother must still be praying (it was a habit she couldn’t break—even if the Lord told her to stop and take it easy, I’m sure she’d slip behind a cloud, recite a couple on the sly). Lorraine and Bea were Martin’s sisters. I spent a wonderful week with great aunt Lorraine in her New York City apartment when I was young. It was magical! She and great uncle Bill took me to their daughter’s wedding at West Point, where Kathy and Terry processed out of the chapel under the crossed swords of academy cadets. They even cut the wedding cake with Uncle Bill’s saber! My third-grade self was totally entranced. Bea was my grandmother; we called her Grandma Thirtle when we were younger. It was always an amazing treat to get to spend the night or the weekend with her. My favorite place that she lived in my growing up years was in an apartment just off 33rd and Cuming here in Omaha, right across the street from what was then Omaha Technical High School. She had the most amazing collection of salt and pepper shakers, and she would let us take them out of the cupboard to dust them or play very carefully with them. I still have one very special set in my possession. Grandma was a very devout Roman Catholic and I know she always hoped all of her children and grandchildren would be, too. When she lived in those Nottingham Apartments we would walk to church, up the hill to St. Cecilia’s Cathedral, one of the most beautiful churches in Omaha. To hear a high mass done there with all the music echoing off the stone walls is a heavenly experience that I still get to have once in a while and it always takes me back to being there with Grandma. But what I learned about myself in this letter from Uncle Martin was about praying over those cards. On those nights I spent with Grandma at her apartment, and what she modeled for me when she eventually came to live with us, was that deep prayer life. Her mother had prayed every night over those cards and other tokens that Uncle Martin and Aunt Lorraine found in her things. It was important to Cora Chicoine to lift her family, her friends and even people whom she hardly knew, up to God almighty. She prayed for their health, their joy, their protection, their souls. If she was like her daughter Bea, my grandmother, she must have done it every night and her family noticed. Who would do it now that she was gone? 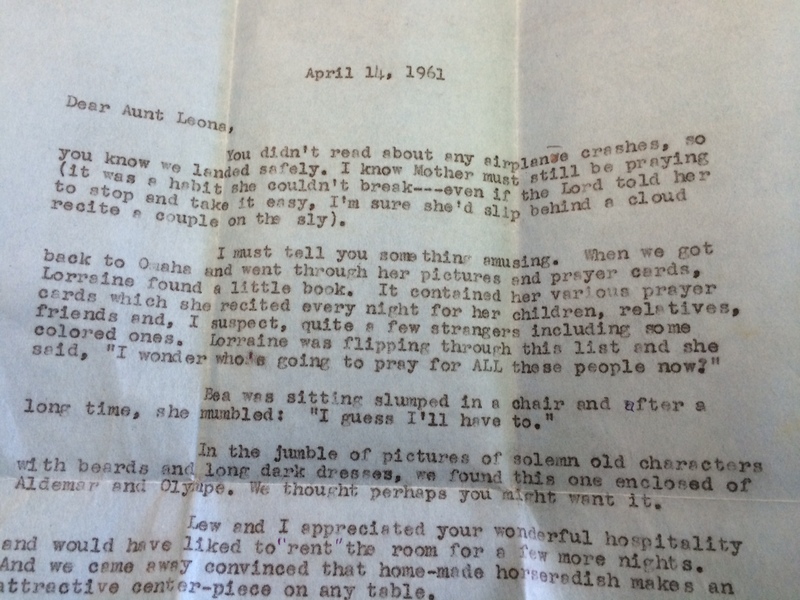 (I think my favorite part about this letter is Uncle Martin’s thought that his mother was still praying for them from heaven!) And my grandmother, her daughter, said, “I guess I’ll have to.” And whether or not she felt that it was a burden or that she was the only one who would possibly assume this mantle, she did. And I noticed. I remember Grandma’s prayer book that would sit on the table by her chair. Every night after she turned off the television, she would pick up that prayer book and go all the way through it. Those cards that were her mother’s plus the ones she had added to it over the years were stuck between all the pages. She would read a prayer from the book and then pray over the card that was there. Every page. Every card. Every night. Before she went to bed. The pages were worn from the use. After she came to live with us in the house on 105th Street, she had another card that she added. It was the one from her own daughter’s funeral, the one for my mom. I have never thought about my nightly prayers in terms of “I guess I’ll have to.” But I love knowing that they continue in my heart from my grandma’s and from her mother’s before that. It’s a privilege to pray for family. For friends. For those I have yet to meet. For those suffering in places many time zones from me. Every night, even though some nights there are so many I fall asleep in the middle of one. I am glad when the Lord tells me to take a break now and then. It explains to me why it is so important to me to have the touchstones of paper memories: photos, articles, prayers in Aramaic, this letter from Uncle Martin, the things my travel journal is stuffed with. Each of them evokes a person or a place that I pray for. I believe God honors each of them and so I don’t stop. They will be as worn as the pages of Grandma’s prayer book some day. Grandma Thirtle had a difficult life. She worked hard for her children after her husband left her. She didn’t have many things, other than those salt and pepper shakers. She didn’t get to travel. She buried two children. But she walked a journey with God that inspires me still and I am grateful to Uncle Martin today for showing me how I am like her. I’m glad you are the keeper of these family treasures. When you write, I try to remember and your memories bring me closer to family I didn’t know as long. I remember that apartment and scrambled eggs that were always white and yellow. Weird. I’d love to read the letter. Just moments ago I spoke with your Aunt Carolyn. I too am the “keeper of the precious papers” in my family. My mother died in 1986 when I was just 21, so much of what is in the dozen or so boxes will remain a mystery. One of the photographs is a high school photo. On the back, in my mother’s handwriting is the name “Carolyn Thirtle”. I wanted to know who this person was, so I Googled her, found an address and wrote her a letter. As soon as she received it she called me and left a message saying she remembered my parents well. (She babysat my older brothers when she was 11 years old.) A little game of phone tag and finally, tonight, we connected. What a delightful lady. I’m making my plans now to drive to Dubuque to meet her in person. What a sweet memory, Becky! Thank you for contacting my Sr. Aunt Carolyn and thank you for finding my blog. She has contributed much to my memory banks. I hope you enjoy your visit with her! Julie, thanks for sharing this story. I was searching the internet tonight for something totally unrelated to our family…and came across your blog and this story. I hadn’t seen that picture before…like Sally, I don’t know most of the stories, but I do remember the salt and pepper shakers from the time when grandma Thirtle lived with us in Illinois. Best to you and everyone in Omaha.